Serena Williams, staggered and struggling, pulled out of Wimbledon. Serena Williams is no stranger to controversy. After all, when she’s not dominating Grand Slam tournaments, she’s suffering some pretty severe medical problems. It’s not Serena’s skills that have her in the news, it’s her medical issues. A disoriented and distressed Serena Williams had to pull out of Wimbledon, suffering from a mysterious virus. 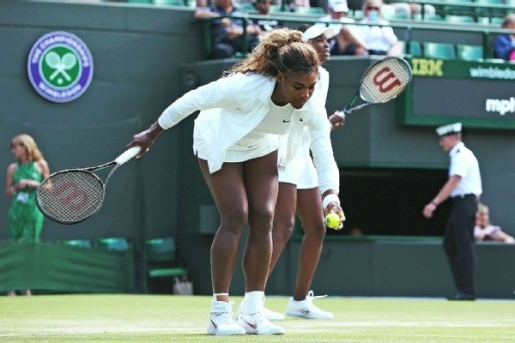 Serena and sister Venus Williams were in the midst of a doubles match with Kristina Barrois and Stefanie Voegele at the All England Club. Serena, who is already out of the singles tournament, is now on her way home, once she recovers enough to travel. A clearly disoriented Serena Williams tried, and failed, to serve four points. After four double faults, the chair umpire came down to speak to Serena. She tried one more time to play, then walked off the court hand-in-hand with sister Venus, where she was examined by medical personnel. The match started 15 minutes late while medical personnel evaluated Serena to make sure she could even play. Giving her the go-ahead, she tried and struggled to complete her doubles match.